~ restored 2015 by J.H. Wagner & Sons. Layer upon layer of paint had been applied to the Crows Nest War Memorial over a period of more than thirty years and while not immediately evident, the damage being caused to the stone structure left the memorial in significant risk of developing problems beyond repair. Marble and Sandstone will naturally breathe and while moisture ingress (moisture penetration) into the stone can cause issues similar to rising damp, if the stone is allowed to breathe the build-up of natural moisture from rain etcetera will typically evaporate or dry-out. Unfortunately, once a stone surface is painted it creates a trap for the moisture and the stone remains damp for longer periods, especially if joints between the stones have not been maintained or have been incorrectly filled with materials which act as a wick to draw moisture into these spaces. In a joint project of Toowoomba Regional Council and Crows Nest Sub Branch RSL an inspection and maintenance report was undertaken by J.H. Wagner & Sons to identify options and priorities for the monument preservation. Having successfully applied for grant funding under the 100 Years of ANZAC scheme, it was possible for much needed restoration works to be undertaken. Highly qualified stone masons from J.H. Wagner & Sons carefully dismantled the monument and transported the components to our Toowoomba factory for restoration works. These works included the removal of thick and multiple layers of paint from the surfaces of the white marble 'Digger' statue, the sandstone capping block, sandstone pediment cap, sandstone die block and two sandstone bases. The 'Digger' statue had previously sustained vandalism damage to the neck area and a replacement of jointing material allowed for much better colour matching and disguise of this damage. The works by J.H. Wagner & Sons also included the addition of names to the marble honour roll panels in lead letters, the repair of black incised letters on the base stone and capping block and the restoration of small Bronze plaques. 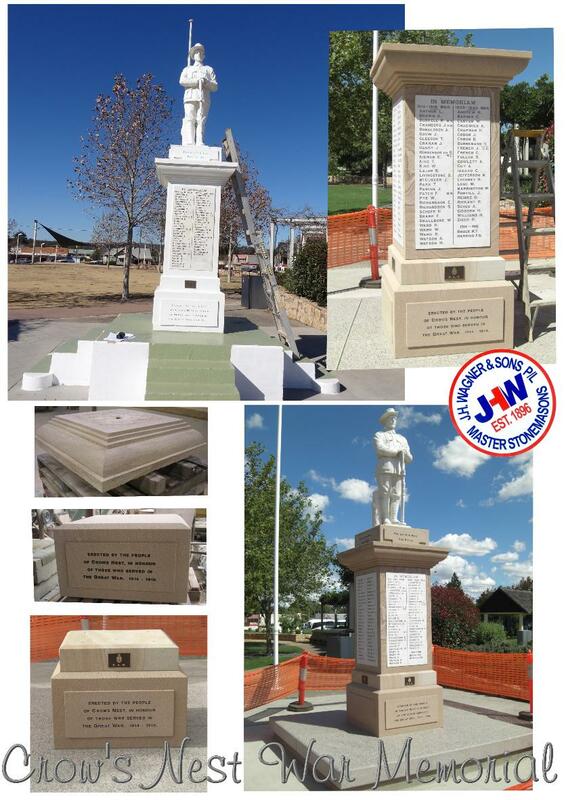 Via a process of close consultation with Toowoomba Regional Council and the Crows Nest Sub Branch RSL during the works, a decision was made to place the monument on a new base stone of Crows Nest granite, known as Toowoomba Coral Granite. The new granite base provides an increased area for the placement of wreaths, improved access to the honour roll panels for viewing and an exfoliated non-slip surface. During dismantling works it was also confirmed that the monument had no significant foundation structure. Planning by Council had allowed for a new foundation if needed and these works were able to co-ordinated without any delay to the restoration process. The Crows Nest War Memorial will now reach it's own 100 centenary in the best possible condition with these restoration works ensuring the monument can be maintained for many more years. J.H. Wagner & Sons have vast experience in providing inspections, condition reports, maintenance schedules, restorations and repairs for all forms of memorials and stone works.